Why Book Rental Accomodations with Chalets at Big White?Chalets at Big White Why Book Rental Accomodations with Chalets at Big White? Big White Ski Resort features 2765 patrolled acres in the 7355 acre resort area with a vertical drop of 777m (2550 ft), 11 lifts, 118 runs with 18% beginner, 54% intermediate, 22% expert and 6% extreme terrain. Other attractions include a Telus Terrain Park with Border/Skier – Cross course, Beginner to Advanced Lanes combined with rails and hits, over 25 km of groomed cross-country trails for both skate and classic technique, Snow Host Tours, Tubing park, Ice Skating Rink, Ice Climbing Tower, Sleigh Rides, Snowmobile Tours, Snowshoeing, Night Skiing, weekly Fireworks, Heli Skiing Tours and more! All this is centered around the largest totally ski in/ski out lodging village in Canada. Chalets at Big White invites you to browse through our site, look at our Vacation Rental accommodations and see what we have to offer. Let us help you have your perfect winter holiday at Big White Ski Resort enjoying all the Okanagan Champagne Powder you can imagine. 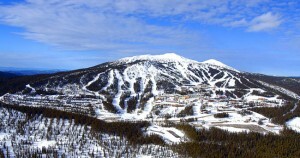 Big White Ski Resort is truly the finest ski destination in British Columbia. We also have our very own FREE mobile app which has all of the information regarding our rental properties as well as much more mountain info. Scan the QR code and download our FREE APP today!! Thank you for visiting Chalets at Big White!